Fifty-five percent of all online product searches begin on Amazon. Last year, the retail giant surpassed $107 billion in total sales. That is over $12,000,000 in sales every hour on average. Amazon Prime alone boasts over 54 million members and counting. If Prime were a country, it would have 8,000,000 more people than Spain and be the 27th most populous in the world. Those are just Amazon Prime members. These mind-blowing stats are indicative of an undeniable fact: Amazon isn’t going anywhere. Many online sellers fear that Amazon is going to cut into their profit margins and inhibit — or outright squash — growth. And let’s be honest: depending on your business model, those fears can be justified. But Amazon’s dominance offers an upside that is proving lucrative for savvy ecommerce pros who have figured out how to make Amazon work for, not against them. Amazon’s control of market and mindshare isn’t a closed ecosystem. They make it quite possible to leverage their advantages for your own business. You simply have to know how to play the game. That’s why we rounded up these 55 experts who know how to win on Amazon and have been doing so for years. Expedite your learning on selling on Amazon by tapping into their expertise below. I don’t care how many you have. Get more. People buy the product on Amazon that has the most positive reviews. When we’re scared about making a decision, our brain falls back to certain factors and uses that limited information to make a decision. That first factor we fall back on is social proof. We look around at everyone else and see what they think is a good idea. If a product has 10x more reviews than other products – we literally have to resist our biology to buy a different one that has less reviews and therefore more risk. Give away as many of your product as you have to in exchange for fair and honest reviews. Build up positive reviews – and incentivize customer ratings if you have to. These are so important and can make or break a sale, not to mention the impact they have on ranking within the platform. Amazon is a reviews-driven ecosystem. It’s vitally important to solicit for reviews effectively and reward customers post-purchase for contributing. Brands should also invest in SEO optimization, especially for Amazon, as it’s a highly competitive environment for pricing, descriptions, reviews and alternative products. Finally, you need to understand Amazon’s pricing structure and adjust your pricing with it. For example, offering a significant discount from time to time or running a daily deal can get you enough brand exposure and attract repeat buyers. That, combined with great reviews and optimized SEO, can make for a winning strategy. Nothing is more effective than reviews on other platforms. When we were selling mobile device products on Amazon we created an ubiquitous effect by promoting our reviews on all of our other channels. Other publications through the display network. Engage with reviewers in a helpful, non-defensive manner. Reviews play a significant role in ranking on Amazon. There are a million review generation tips out there. Most of them will work at some level. Beyond that, really consider promoting Amazon through marketing channels typically reserved for your own website. Amazon listings can be SEO’d. They can be advertised using PPC. They can be promoted via email and social. Also make sure you’re planning ways to segment Amazon sales away from other sales channels to avoid creating your own competition. The most important thing on Amazon is ratings. Make sure to have an automated process for gathering ratings from your customers. The Amazon algorithm that determines search rankings is highly influenced by product ratings, which is why ratings should be of high priority for your brand. Another way is to think of your Amazon product site as an SEO site. This means you should include relevant keywords in your copy but be careful of keyword stuffing because search engines penalize this. Get reviews! Quality and quantity are necessary. It’s also better to have a few not-so-great reviews mixed in as long as your overall rating is strong. It makes your listing look real. If all you have is a few 5-star reviews, customers will assume it was you or your mom who reviewed your product. Several studies show that products with more reviews outperform products with fewer reviews, even if the product with fewer reviews has a slightly higher average rating. More reviews = more confidence. Reviews from past customers give you the credibility you wouldn’t otherwise get. It’s an extra portion of word-of-mouth that boosts your offer. It’s in your best interest to get as many of them as possible. Have a customer that’s raving about a particular product? Ask them to provide a review. Happy customers won’t mind and it can significantly increase the number of reviews you get. But nothing beats working toward getting tons of legitimate 5-star reviews. Positive reviews drive higher conversion rates and drive rankings. Email your customers after they purchase asking for Amazon reviews and watch your rankings go up! Understand how Amazon SEO works. Their algorithm is much simpler, yet different than Google’s and they utilize different factors. Understand that, then do you keyword research accordingly. The principles of onpage SEO can be applied to many mediums: websites, Pinterest, and Amazon (to name just a few). So take the time to do your keyword research, as well as competitor research. Both of these activities can provide a useful new perspective of what “success” looks like on Amazon. You have to anticipate the most important words your prospects will search. Then, good images, and especially good copy with a strong what’s in it for me, and a call to action. Understand that reviews and SEO play a large part in getting your product listings in front of more people. Amazon is a search engine as much as it is a marketplace. People search for products on Amazon. And Amazon has ranking factors to help it determine which products to show, in which order, when someone performs a search. So do some research on Amazon’s SEO factors. Things like title, subtitle, description, questions and answers, and even pictures all factor in on how a product will rank. Pay attention to keywords that people will use to find your products, and look at what keywords your competitors are using. Reviews also play a big part in your ranking on Amazon. The frequency and overall number of reviews you get will help Amazon determine your rank. Be careful not to break Amazon’s terms of service with respect to soliciting reviews, but do try to solicit reviews. You’ll need them. Especially early on when you’re trying to get some traction for a new product. Write long, detailed product descriptions. At least 1,000 words. Not just fluff, either – add LSI keywords. Again, keyword research is CRITICAL here. Also, have a presence off of Amazon. It’s the best way to grow, besides the obvious things like great pictures/description and competitive pricing. Product content is the key to success. Following their best practices around descriptions, categories, titles, and A+ content will help you dominate search results. Invest in quality product shots. While it’s always important to understand the value of optimizing for search rankings and getting positive reviews – first impressions matter on Amazon. The number of new entrants into every category is through the roof. If you want to stand out, it’s time to invest in not only building your own brand to help support an increased amount of search, but also time to invest in high-quality visuals to give a quality first impression. Optimize your listings with proper images and content. Those will help customers make better decisions….only then should you be spending any money on advertising. Otherwise, you are spending money to drive traffic to poor listings…yikes! Use Amazon’s Keyword Tool to optimize your copy around long-tail keywords that are less competitive. Sell more through Amazon on your own site by using the Pay With Amazon button. Consumers trust Amazon more than you and they have their credit card details already stored for easy checkout. Try as best as you can to focus on your customer experience and conversion rates. Although you’re limited in what you can do on Amazon, anything you can do to optimize your marketplace listings for conversion will catch the eye of the Amazon search algorithms. Proper title, bullet points, description and great images can drastically improve your sales. Include quality, accurate, detailed descriptions. Buyers appreciate more than just the “pre-filled” descriptions of items. The key to success on Amazon is optimizing for their search algorithm. Also, influence buyers by having good ratings and reviews around your product. There are many ways to accomplish this, but one critical thing to do is to comment/reply to all your current reviews. Don’t just be an Amazon brand. I mean that just because you’re selling on Amazon doesn’t mean that you can’t promote the products with content, influencer campaigns, and get your products featured in the press. If your looking to increase sales on Amazon, I would look away from paid advertising and instead look at using inbound marketing tactics to bring traffic to your products. You can drive hundreds of visitors per day to your Amazon store or product pages just by creating a strong presence on niche forum sites, Facebook groups and other social media channels. They’re not the most vendor-friendly platform and make changes from time to time that aren’t in the best interests of sellers. Not saying Amazon isn’t a big deal, just suggesting that Amazon should be just one pillar of four or more major channels including Facebook Ads and Google Ads – and, of course, your own direct web storefront. For direct-to-consumer players, think of Amazon as customer acquisition. Choose some small AOV top sellers and make sure you put them on Amazon. Encourage follow-on purchases through your own site in order to capture more customer data, up-and cross-sell, and increase overall LTV. Master the art of branding. Whenever customers search for products on Amazon, the search engine displays many similar products. Understanding how to position your brand properly will help you stand out. This includes product pictures, pricing, product description, reviews, etc. In order to accomplish the feat, you must nail your target market. Deeply understand your target market and you will succeed. Amazon also allows you to sell your service on Amazon. When people buy products, your service can be offered as an add-on and everything is handled through Amazon. This is something I know from personal experience. We bought a ceiling fan and at the same time, I bought the installation from a local small company. Payment was handled through Amazon and then the company called me to set up an appointment. Don’t compete on price! Unless you have a tool for it. Protect yourself with strategic pricing. Try setting up your campaigns in a way where the customer’s search discovery process, i.e., when they are first introduced to your brand on Amazon, is always under a certain price. Set custom labels that tier products by prices, exclude as many skus as you need to, and you’ll be sure to keep third-party retailers from stealing your customers by offering cheaper rates. By choosing not to bid on certain products that are beyond a specific price point, you can still beat the competition on Amazon. Don’t compete on price – it’s a race to the bottom and it’s easy to become a busy fool. Instead, focus on improving your rating by responding to all of the messages that matter, as this a sure-fire way to ensure customers value you as a seller and choose you over somebody else. Sync your stock to avoid overselling. The #1 rule of retail economics will always be that you make your money on the buy. Thus, driving additional sales, even at less than your target price, will allow you to ultimately buy more and lower your sourcing costs. The best way to drive additional sales on Amazon is by using a repricing tool (with price floor limits of course) to constantly fight for, and win, the buy box. Are you ready to sell on Amazon? Better know the basics. Control your distribution and your product detail pages. Brands that have their pricing levels at close parity with other channels and don’t have dozens of unauthorized resellers competing for buy box share have the best chance at success. They’re able to build momentum on the channel and utilize advertising to increase their product sales and organic visibility over time. Brands on Amazon must have a granular, sophisticated, technology-driven advertising solution in place in order to compete on today’s Marketplace. If you’re looking to expand sales on Amazon, do it carefully. Make sure you have the bandwidth and necessary resources to take on additional orders. For example, an inventory management system can help prevent overselling items, and order management systems can help ensure timely deliveries. Stock-outs and late deliveries can result in poor customer reviews, or a suspended Amazon account. Additionally, try partnering with other brands and use Amazon as a laboratory for new offerings. For example, an apparel retailer partnering with smaller universities to offer branded products on Amazon that customers couldn’t find elsewhere. The Amazon channel should have its own team and its own procedures within your organization. With roughly half of the online market share in the USA, you just can’t succeed on Amazon unless you have a dedicated team with dedicated time and expertise on this channel. 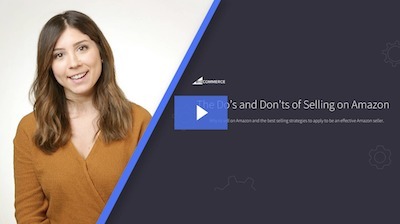 There is so much to unpack here that it would take a book to share everything, but focusing on the best-sellers on the Amazon product categories pages can help you know if your items are priced well enough to gain sales and profits. Focus on decreasing inventory errors like mis-picks, mis-ships, and out-of-stocks. Order & inventory accuracy, as well as fewer customer mishaps, are both highly determining factors for winning the Buy Box and gaining access to the Prime Merchant-Fulfilled program. Amazon rewards sellers who can ship quickly and accurately. Our clients are, often, best of breed in their segments. They provide fast fulfillment and avoid oversells or cancellations, and as a result, Amazon rewards them with prime seller advantages. If your main sales channel is BigCommerce, you can segment your email list and visitor lists after a certain period of time (i.e. 60 days and never purchased from your site) and drive them to Amazon. Surprisingly, these old leads that might never purchase on your website but want your product and trust Amazon. No question – build a proprietary customer list. You can start for little money with product inserts directing your most loyal customers to a Facebook group or website to grab their email. More advanced sellers with greater resources can run Facebook ads to a squeeze page for easy email grab using ClickFunnels. This email list is critical for future product launches and to create Lookalike audiences on Facebook. Sponsored Products are a great way to drive additional traffic to your Amazon listings. You can significantly level the playing field in terms of visibility against long-established competitors. FBA – Fulfilled by Amazon. Amazon sells 24/7 and setting up a FBA account on products you know will sell well will certainly increase your sales. FBA comes at a higher cost so a little Googling prior to doing this is best advise. Having an Amazon store as well will help to keep abreast of the competition, which most likely is already selling on Amazon. Use paid search promotions inside Amazon. And use your brand name and best performing keywords from Google Adwords. Focus on the buy box. Unless you’re selling truly unique products, you’re likely competing with other sellers to be the merchant behind the “Add to Cart” button. There are two big ways to get in Amazon’s favor — and, Amazon being Amazon, they center around shipping. Utilize Fulfillment By Amazon, their fulfillment service, to store and ship orders, and if you’re a quick-shipping, high-volume e-retailer, try to qualify for their Seller Fulfilled Prime program, which guarantees access to lucrative Prime customers. Give Amazon’s suggested PPC campaigns a try. I’ve seen a number of clients test them compared to the campaigns they built themselves based on tons of keyword data, metrics, etc., and still have Amazon’s auto-generated campaigns produce a higher ROI. If it works for your brand, that’s time you can spend elsewhere. With more than 2 million sellers worldwide selling on Amazon, gaining the necessary visibility to succeed can be difficult. However, all hope isn’t lost. Amazon’s latest release, headline search ads, may help new and experienced sellers by putting their products front and center in Amazon search results. Headline search ads are pay-per-click ads that help sellers target customers based on specific search terms. Once campaign parameters are set (keywords, bid amount and daily budget), headline search ads appear at the top of search results – a powerful opportunity to outrank similar products (aka healthy competition), drive shoppers to your listings and increase sales. Sell with Fulfillment by Amazon (FBA). Not only does this reduce work in handling orders, but FBA products will appear in Prime-filtered searches. Also, products which are Prime eligible have higher conversion rates than those that do not. On top of this, having FBA products will allow you to tag on to the success that Amazon has built with its brand and align your business to their reputation. Amazon has a lot of similarities to Google Shopping – they are keyword and price driven. If you’re doing well on Google Shopping, export the list of keywords and see what you’re doing the best at – then use that to bid on those keywords on Amazon to get some initial traffic flowing through and see if those keywords are going to work on Amazon as well. If someone is selling the same items as you on Amazon, then you should consider creating a unique offer by bundling products together in new configurations. The beauty of this is that your bundle will be listed as a unique product by Amazon, and when you’re the only seller carrying a listing, you’ll be able to win that all-important spot in the Buy Box. Stay in niches that Amazon will not play in. Niches that are high touch & where you can value add through the experience. If you sell a variety of products, that may or may not be unique from your competition, focus on selling the more unique products on Amazon and building up your product reviews. Once you have several products that have a lot of positive feedback, then even if you have other products that your competitors have, you may build more of a loyal following based on those few unique products. The biggest tip I have for Amazon is try to tack on an extra item with your listing. Normally if you’re selling an item on Amazon, other sellers can be on that same listing. That means you’re not guaranteed to get the sale for that item, especially if you’re not the lowest price. We skirted around this by selling board games with a simple extra dice bag or expansion for the game. This allowed us to have our own unique listing that would still show up for the main product in Amazon search. This gave us more flexibility with the price, because we weren’t trying to compete with other sellers for the same item. Plus, every purchase that came through that listing went straight to us. Endeavor to own your brand and listings on Amazon. Competing with other retailers (including Amazon) on price is almost always certainly a race to the bottom. A single product listing with 10 sellers means that sellers can only really differentiate themselves by price alone. This is a dangerous position to be in as a retailer and in business. You may eventually sell at your desired target price, but this may mean making a trade off in keeping stock longer with reduced inventory turnover. In Australia? The clock is ticking! We need to do it! Amazon has only just arrived in Australia and at the moment we don’t have a presence and we are potentially missing out on many orders and expansion. This will be our main focus in the coming months.